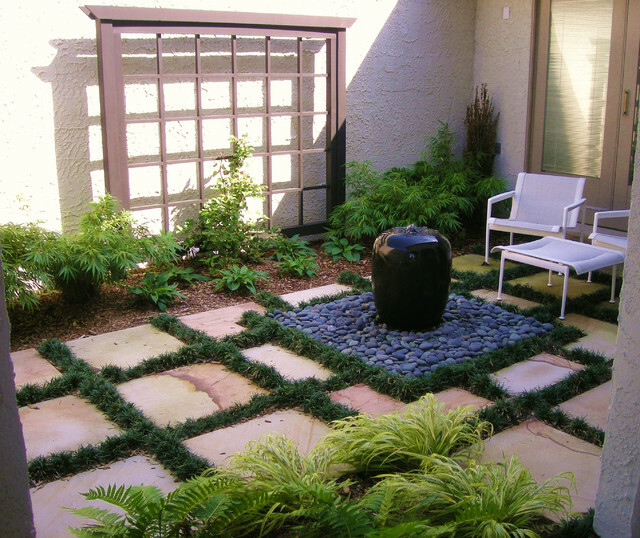 This entry courtyard has a water feature that adds the sound of trickling water to the space. A peaceful space to relax in. What kind of filler grass is this? Do you irrigate the mondo grass? Overhead spray or drip buried? How much trimming is necessary? Very attractive. This garden has overhead spray irrigation. Mondo grass is very slow growing and does not need much trimming, do not cut back like ornamental grasses at the end of the season. Additionally if using in this application, make sure it's not in direct sunlight. This was a bubbler kit from www.stoneforest.com. Tiles - What type of tiles are these and where can I purchase them? The stone is Tennesse Crab Orchard and can be found at many stone yards. Client ordered the charis and ottoman. not something we were involved in. Japanese StyleThe landscape design-build team of Statile & Todd gave this courtyard a tranquil feel by way of a kit fountain from Stone Forest. How it works: Much like a custom fountain, a kit fountain has its accompanying water basin reserve hidden under the rocks. Cost: A fountain of this size can run about $400 to $500.